How Do Not-for-Profits Use Web Developers? How do not-for-profits use web developers? A not-for-profit is any organization that isn’t operated like a company for the financial benefit of its shareholders and investors. This includes colleges and universities and government agencies. It also includes the similarly named, but more narrowly defined, nonprofits. A nonprofit has a specific organizational structure that resembles a company, but that is not allowed to make a profit from its activities. What you should realize here is the difference between working as a web developer for a for-profit company (whether a web services company, or another type of company) and a not-for-profit. Many not-for-profits have organizational structures very much like companies, and use web developers in the same way. However, to generalize, a not-for-profit lacks a certain focus and discipline that the need to make a profit imposes on companies of all types. It’s a prejudice, but a prejudice with truth in it, that everything moves more slowly in the not-for-profit world. There simply isn’t the same fear of quickly losing market share, with the possibility of going out of business, that drives for-profit companies. What does this mean for web developers planning their careers? Not much that’s good. A slow pace, a lack of focus, or a lack of discipline, is slow poison to a web developer of any kind. There are not-for-profits that work with the latest technologies. In a college or university environment, you might be an early recipient of a new technological breakthrough in some critical web technology. But these situations are the exception rather than the rule. And there are not-for-profits where you can do good or interesting work. What you want to avoid is getting captured by the gravity of the not-for-profit world. If you’re not careful, you can easily end up with skills, knowledge, experience, and connections that will suit you well for moving between one not-for-profit and another, but that don’t allow you to move back into the larger, more lucrative, and more exciting for-profit world when you’re ready to do that. Following is a brief summary of the pros and cons of working for a not-for-profit organization. Use it to help chart your course. Pros: It feels great to do work you believe in with people who are not always chasing the almighty dollar (or British pounds, or euros, or remnibi). The good feeling of working in organizations with strongly positive purposes may outweigh any negatives that many not-for-profits carry with them. Cons: Pay on the low side, demands on the high side. Less awareness of, and less willingness to use, complex technologies. Progress in the use of new technologies can move very slowly, and then just completely stop. Salary: Usually low to medium. Not a lot of travel or perks. Benefits: If you stay for a long time, there may be retirement and other benefits that make this a worthwhile path to consider for your overall lifestyle. Career path: You can build a worthwhile career in not-for-profits, but consider working out of a web services company, or moving back and forth to the business world, to avoid becoming stuck in not-for-profit world. 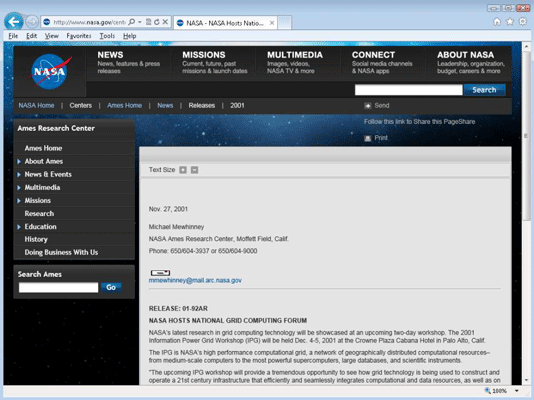 Check out this NASA page promoting the National Grid Computing Forum, one of the cutting-edge technology projects you can find in not-for-profit organizations.